"With each visit, you give dignity to the life of someone you did not even know in the time when that life was very different. Thank you for everything." 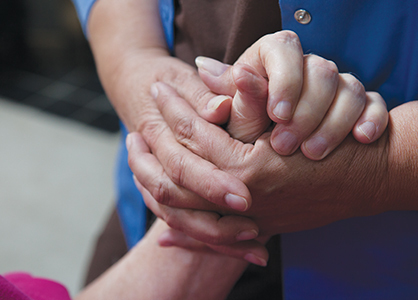 "To my mother’s wonderful team of caregivers: It is National Hospice and Palliative Care Month in November. How fitting that it is the month in which we express our gratitude and gratefulness at Thanksgiving, and throughout the month are reminded of our blessings. Yet not just the month, but every day the Heartland Hospice volunteers give their time and talent to enrich the lives of our loved ones, is a day to be grateful. Whether it is competent medical care, or a kind word or compassionate touch to the hand, or a song sung or instrument played, or a book, a magazine or a letter read, or a game played or craft completed, or balloons blown up and watched together as they 'dance and float' about the room; whether it is a soothing voice, or it is the listening ears, or a shared prayer expressing what my mother perhaps cannot express for herself, or simply the silent assurance of one’s presence, the affirmation of both laughter and tears -- it is evident that when a member of the Heartland Hospice team arrives to care for my mother, the day is made better. Thanks to my mom’s Heartland team for their compassionate care and affirmation of her good life by helping to give her a good death. As dementia chips away at her abilities, you support her in the things she can do. As her memory fades, you give her moments to cherish in real time. Please know that you are appreciated beyond these words for what you have chosen to do. With each visit, you give dignity to the life of someone you did not even know in the time when that life was very different. Thank you for everything." At Heartland, we understand that hospice patients with heart disease and their caregivers deserve a specialized level of care. We believe that the quality of life for our cardiac patients can be enhanced through care designed to meet their physical, psychological and spiritual needs. Our care focuses on providing proactive therapies, as well as experienced pain and symptom management and psychological support. For more information about Heartland Hospice services near you, click here.